Workers’ Party member Gerald Giam wrote on his blog: ‘Why does the MND suddenly feel the urge to tell residents what they should think of their town councils, and by extension, their MPs? — “Perception of bias dents report’s credibility”, Straits Times, 3 July 2010. It’s a no-brainer to identify the two opposition wards, Hougang and Potong Pasir. Their grants are dwarfed by the other town councils. Even taking into account the smaller size of their wards, the opposition wards still receive far less per resident. Notice in the diagram that the two opposition wards are given no funds at all for “town improvements” via Community Improvement Programme (CIP), whereas all the PAP wards have generous amounts of CIP funds lavished on them. These are channelled through the Citizens’ Consultative Committees (CCCs), another taxpayer-funded grassroot outfit widely recognised as being aligned to the PAP. This is another jaw-dropper. In total since the last election in 2006, the Government has splurged almost $3 billion on various “national” upgrading programmes. As far as I am aware, none of these funds are shared with opposition wards. In fact, even putting aside the facts and figures, Singaporeans living in other wards should take a trip down to Potong Pasir or Hougang to see those wards for themselves. While there is an absence of outlandish sculptures or expensive artificial landmarks like those found in some PAP wards, the improvements that genuinely benefit residents have been made. 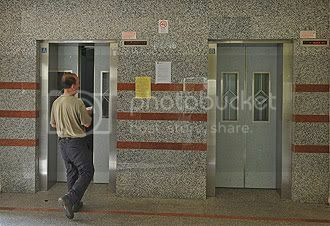 Blocks in Hougang have also been spruced up and renovated, to the extent that some of the lift lobbies look almost like those in private condos. An example is shown in this photo below that was taken from the Straits Times today. Ultimately, the best judges of the town councils’ performance are residents themselves. Chiam See Tong has been re-elected five times and Low Thia Khiang has been re-elected three times since they first won their seats in 1984 and 1991 respectively. Chiam has been in office longer than any other PAP backbencher. All this is proof that the two opposition town councils have done exceptionally well, even with less funding and a host of factors stacked against them. Residents in PAP wards should talk to their friends and family in Hougang and Potong Pasir and discover for themselves that decent opposition politicians can do a good job in running their wards, if given the opportunity. A good write up on the town council report. her party has scored a most convincing OWN GOAL. Elimination is possibly just a match away. has to be by the people and for the people. often apparently brainless clones who exist to serve their party’s grip on power. I just find it very ironic that the opposition wards would do far better job at being cheaper, better and faster than their PAP counterparts. Thanks for the insight Gerald! Good Work! This makes you wonder how efficiently the PAP town councils manage their funds. Are they splurging on unnecessary projects? However, it is hard to judge that because of 2 issues: qualitative improvement and spending per capita. Clearly, another sign that political competition will give citizens the best outcome for money.